Struggling to Fill Your Enterprise Workshops? Your Latest Enterprise Marketing Campaign Didn’t Deliver the Goods? Not Enough Entrepreneurs Renting Your Space? Always Getting the Usual Suspects Showing Up? Your Networks not Filling as Quickly as You Would Like? Marketing Costs per Prospect Way Too High? Then perhaps you should join us at a one day workshop – Enterprise and Social Marketing – where you will learn practical ideas and strategies to get your marketing working. The music is not my cup of tea – but the sentiment is! Sorry I can’t embed the video here – you’ll have to pop over to you tube to see it. How best to respond in uncertain times? Images in the media of managers clearing their desks and heading for home with their possessions in cardboard boxes makes us all think about our own job security. So what should you do to maximise your chances of thriving through the credit crunch. Keep developing your staff – build their skills, knowledge and ability to add value on a weekly basis through coaching – being the leader of a high performing team is perhaps your ultimate protection. Continue to invest in your relationships with your team members – in a tightening labour market your best staff will be looking for an employer that allows them to really create value and maximise their potential. Poorer performers are likely to be keeping their heads down. IF it comes to having to make redundancies you need to know who you to retain and who you can afford to let go. Often it is the most able performers that take redundancy offers – confident in their ability to find new ways of making a living. Provide positive leadership messages. Yes times are hard but the fundamentals of good business remain the same. If we can increase quality and productivity and reduce costs then we will have an excellent opportunity to navigate through turbulent waters. This could be just the right time to ask team members of that little bit more effort – however if you have left it until now to start providing positive, robust management…. Manage under performers robustly. You need to be rigorous but NEVER ruthless. Reinforce what you expect from them in terms of quality and performance at work. You really cannot afford to carry any passengers at this time and good people will be coming onto the labour market. Work as diligently and as professionally as you can to get people up to the standards you demand. Delegate more – and use coaching and feedback to make sure that delegation works. Use delegation to make sure that you have the time to focus on doing the things that matter most. Delegation enables you to create significantly more value for the business without increasing overheads. Keep your CV up to date and make sure that all of your professional accomplishments are recorded. Sometimes even the best managers are made redundant, so make sure to keep all of your networks well maintained. Invest more time in relationships with peers and your seniors. Use your networks to the max to get a clear picture of what is happening. Also use your networks to make sure that your team is getting a fair press and all of its achievements are recognised. It is an unfortunate truth that tough times are sometimes when people are at their most responsive to the performance improvement message – and you will get recognition for making tough decisions. Get rid of the dead wood and watch the remaining talent flourish. The Credit Crunch – An Upside for Enterprise? One of the consequences of the credit crunch will be sizable lay-offs in the finance and associated sectors. I think the ripples will be felt in terms of redundancies throughout the economy. However it will mean that here in Yorkshire I would guess more than 1000 people will be made redundant from some of the large financial employers. This is a rapid acceleration of a process that has been happening anyway for a while now. Big businesses are destroying rather than creating jobs and it is the SME sector that is still creating employment. So what does the credit crunch mean for enterprise professionals? Well lots of skilled employees coming into a contracting labour market, with strong work habits, mortgages to pay and redundancy cheques in their hands sounds like a good market place to me. I just hope that in planning their outplacement support the banks don’t just commission the usual ‘interview skills’ and ‘CV clinic’ type stuff – but actually help people to consider the potential for self employment and entrepreneurship as well. Wish you could have access to 99 free online classes on Business and Entrepreneurship? I have not checked out all of the resources but the ones I have checked out have been from pretty reputable providers. Some are genuine online learnin modules. Others allow you to download course notes. It is pretty biased towards the US but the basics of entrepreneurship and enteprise remain the same whichever side of the pond. If you have any other online resources that you would recommend please do share them via the comments box. So says one enterprise marketing initiative. And unless an idea ‘stacks up’ against most of these headings they drop it and move on to the next idea. If it does stack up then they might start to put together a team interested in working on the business plan. In my experience the truth is that the value of most ideas is zero – or close to it. In fact it is even worse than that – most ideas actually cost you time, money and relationships. So in spite of pressures to create start-ups sometimes the best advice we can give to a potential entrepreneur is to just slow down consider their idea carefully against a set of sensible criteria and help them to understand that in time the right idea will come along. There is much policy and rhetoric about the need to transform the ‘enterprise culture’ of our communities (especially those that make higher than average use of the benefits system). So far so good. But now the problems start. In order to try to get these metrics moving in the desired direction we tinker with the supply side on a whole series of employment/skills and business start-up interventions, designed to make them more accessible to target communities. In the local Children’s Centre or Church Hall half day workshops on ‘Turning your Business Dream into Reality’, ‘Turning your Hobby into Cash’ and ‘Employment Skills’ appear alongside workshops for ‘Tumbling Tots’ and ‘Breastfeeding for Beginners’. Now the ‘Tumbling Tots’ and ‘Breast Feeding for Beginners’ workshops are usually pretty popular. While often the enterprise and employment workshops struggle to get the numbers they need. Even enticements of free food and the indication that grants and funding might be available often fail to get punters through the door. Although the reasons for the difference in take up are obvious they are worth re-considering for those of who are interested in stimulating enterprise. Often new, poorly paid and inexperienced outreach workers (who have yet to gel as a team with few established record keeping, client management and referral systems) on short term contracts looking to achieve short term outcomes. An agenda (entrepreneurship) that does not chime with local social, economic, political and cultural norms – and is often seen as being imposed from the outside. Little wonder that our best efforts to expand the supply side of the enterprise market place in targeted communities in a well intended drive to increase ‘engagement’ is so often met with apparent indifference. So what can we do that might encourage the take up of more enterprise services and the transformation of the enterprise culture? I think that the answer lies not in continuing to develop and refine the supply side. Fewer half day workshops and new enterprise centres. No more ambitious and expensive push marketing plans. Instead we should focus in the short term (3-5 years?) on nurturing the demand side. Finding ways to stimulate a genuine curiosity about the enterprise agenda. On holding conversations (open space events, knowledge cafes etc) about what a more enterprising community would look and feel like. What benefits could it bring to local people? What are the possibiliites that we can pursue to make progress on the enterprise agenda – building on what we already have and can do? How can local people engage in driving the enteprise agenda? Who can local people invite to help them transform their enterprise culture? How can we make enterprise a socially inclusive sport? On helping more local people to recognise that they can make progress on their agendas (rather than being manipulated into the agendas of others). Recognise the ‘well trodden pathways’ that they are on and to choose different pathways if they so wish. Recognise and valuing ‘failure’ as a part of the process. To recognise the difference between people failing and their ideas failing. On recognising that the social context and networks are crucial for supporting enterprise. Develop connectors, mavens and salespeople at the local level who can change the ‘vibe’ around enterprise and form them into competent, credible and person centred outreach teams who are prepared to advocate enterprise. In my expereince most communities are already developing such mavens, connectors and salespeople. The neighbourhood management team, local youth groups, faith based groups and other community based projects are often an excellent place to start your search. As a good friend of mine said, ‘going into a community that has experienced long periods of economic and social decay and prescribing an increase in entrepreneurship is a little bit like going into Burkina Faso and, on noticing that they don’t have a state of the art scientific research programme, suggesting that they invest in a large hadron collider, a stem cell research project or a programme of space exploration as a way of bringing them quickly up to world class’. We have to develop enterprise strategies that acknowledge where people are at rather than where we want them to be. In this way I think enterprise professionals can really start to play a part in transforming the culture of some of our most disadvantaged communities. And in time we might have local people queing up for places on our enterprise workshops and to take up space in our enterprise centres. I am a massive fan of both giving and getting great feedback. And yet I know that many managers avoid giving feedback – or even worse give it in ways that are so subtle as to be pointless. What Every Manager Should Know About Feedback is a superb article that reflects much of what I teach on my Giving and Getting Great Feedback workshop. I recommend both the article and workshop highly. Mihaly Csikszentmihalyi has spent much of his life researching ‘flow’ – that state of being when you become fully immersed in a task and time flies by. This flow state can only occur when the level of challenge is carefully matched to your level of skills and confidence. Flow is most likely to occur when you are faced by a demanding but achieveable task. Flow matters for managers because it a state that is associated with optimal performance. It is also closely associated with learning and self improvement. It strikes me that delegation used in conjunction with feedback (another pre-requisite for the flow state) and coaching provides managers with the perfect tools to ensure that team members get a balance of skill and challenge that will enable them to enter the optimum state of flow at work. Employees who are operating outside of the flow channel – either bored or overly anxious are likely to be performing well below their potential. The thing about the flow channel is that you cannot remain stationery. Unless you are confronted with new challenges it is likely that boredom will become an issue and performance will dip. 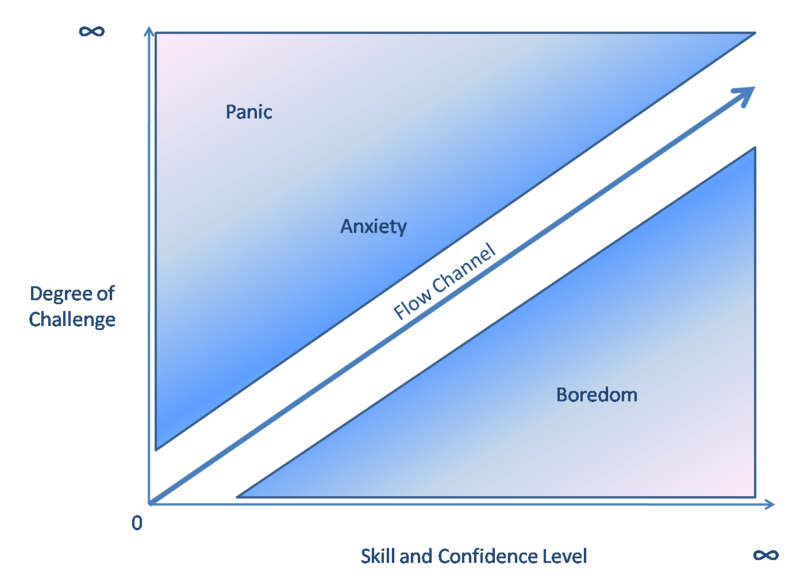 Mihaly Csikszentmihalyi suggests that the level of challenge needs to be carefully matched to the level of skill and confidence if the learner is to stay in the ‘flow channel’ that exists between anxiety and panic on the one hand and boredom on the other. Too much challenge and not enough skills and the learner is likely to feel panic and anxiety and may withdraw from the development process. Too many skills and not enough challenge is likely to lead to boredom and also increase the probability of withdrawal. Get the balance right between the level of challenge and thelevel of skills and confidence and you have every chance that they well get ‘into the zone’. As enterprise coaches (especially those of us working in communities with low levels of educational attainment) it is my belief that we often float the challenge of self employment and entrepreneurship much too early in the development process for some of our clients. The mismatch between the challenge (you could run your own business) and the perceived level of skill and experience is so high that we induce anxiety, fear and panic and are likely to experience high drop-out levels. This problem is especially acute when policy drivers lead to ‘fast enterprise’ projects designed to accelerate the client towards entrepreneurship. This often manifests itself in a range of workshops designed to put people on the ‘fast track to entrepreneurship’. In practice such workshops often struggle to recruit participants from the target market and experience high drop out rates. Recognise that self employment and entrepreneurship may lie way outside the comfort zone for many people in the communities we serve. We have to use an ‘intermediate technology’ to help them to make progress from where they are at, in terms of both their technical skills and their psychological state (confidence, motivation, self esteem and self-belief). Start to engage in more ‘person centred’ ways about what progress might look like to them at the moment. Help them to set goals for progress that are challenging but realistic and provide them with the support and guidance that they need to achieve. This WILL lead to personal development and to them learning to use enterprise skills to make progress. Help them to recognise the progress that they have made and the skills and abilities that they have used along the way. Ask them again to think about what progress they want to make now and repeat the cycle. If we can help enough people to steer a course of personal development that delivers real progress on the problems and opportunities that face them we may find that before we know it we have a number of people who are ready to start working with us on their plans for entrepreneurship.